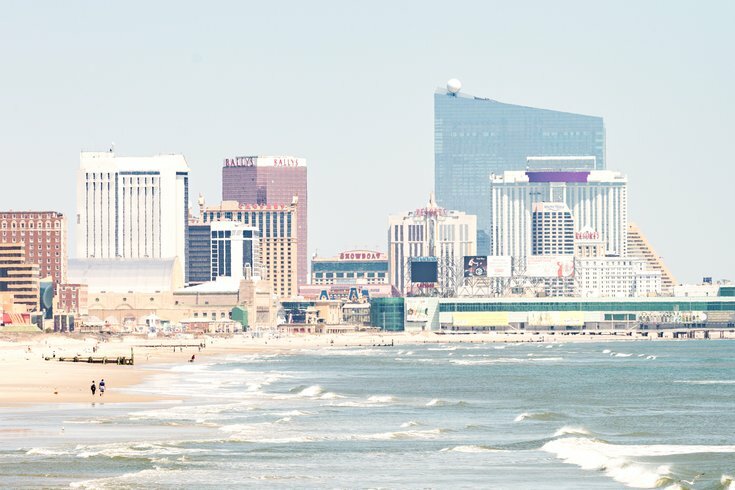 Casinos fill the Atlantic City skyline, May 1, 2018. In the midst of the severe thunderstorms that battered the Northeast on Tuesday afternoon, the New Jersey coast was struck by a small tsunami, according to the National Weather Service. Meteorologists said a meteotsunami, an event described as a massive high-speed wave over shallow water, hit the Atlantic City coastline around 8:40 p.m.
Generally speaking, meteotsunamis are too small to notice and don't pack the coast punch of the extreme events driven by earthquakes, such as the catastrophes in Indonesia in 2004 and Japan in 2011. Tuesday's meteotsunami resulted in water level fluctuations for a period of several hours, but there was no damage reported on Wednesday. Last night's powerful storms resulted in at least five deaths and left thousands of customers without power into Wednesday. Rain is expected to continue through the rest of the week as moisture from the Gulf of Mexico sends storms systems up the eastern seaboard.